In the Czech Republic we have different “best of”. Some are positive, others are less. Some carry an interesting story. One of them is the story of Stalin’s monument – the largest group sculpture in Europe in 1955-1962. As I mentioned in the introduction, the Stalin Memorial was the largest group sculpture in Europe in 1955–1962. It was built in Prague at Letná, in honor of Soviet leader Josif Vissarionovich Stalin in the post-war cult of personality. The new stadium of the SK Slavia Praha football club was located in the place where the monument was to be located; due to the construction of the monument the stadium was demolished almost immediately after completion. The construction of the monument began on 22 December 1949 with the participation of Antonín Zápotocký. The actual work on the sculpture began only in February 1952 and was unveiled on May 1, 1955, ie on the Labor Day. The motto was “For our Liberator – Czechoslovak People”. However, a person knowledgeable of history knows that at this time Stalin is already dead. In addition, Khrushchev’s speech, criticizing Stalin’s cult of personality, will take place shortly after the monument is unveiled. So Soviet policy is changing and the statue celebrating Stalin is no longer suitable. 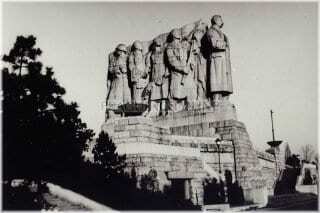 The monument was portrayed as a series of standing figures, headed by Josif Stalin; behind him stood the figures of the workers. After Stalin’s left hand were representatives of the Soviet people (worker, scientist, kolkhoz and soldier) and on his right hand the representatives of the Czechoslovak people (worker, peasant, innovator and private). Two of the characters had specific forms, namely Julius Fučík and Ivan Vladimirovič Mičurina. 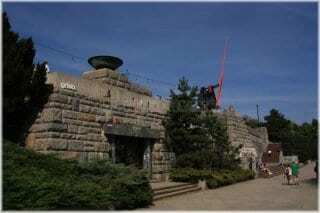 The monument made of yellow-white worked granite blocks stood on a large 15-meter-high reinforced concrete structure embedded in the Letná slope. The sculptural group had dimensions of 15.5 m in height, 12 m in width and 22 m in length. After the appearance of Stalin’s successor N. S. Khrushchev, who condemned the so-called Stalin cult of personality, the Czechoslovak Communists decided to destroy the monument. The final decision was to destroy the monument by partial blasting. It happened in November 1962. So the statue “lived” only 7 years. Blasting took several weeks and whole process was strictly guarded. After the destruction, there were plenty of suggestions to build there instead of Stalin. On the pedestal today stands the moving metronome of sculptor Vratislav Karel Novák from 1991. And that’s the place you can visit these day and I highly recommend it! From this place you can have an amazing view on Prague!